*Also Note: All surrounds include a safety barrier. 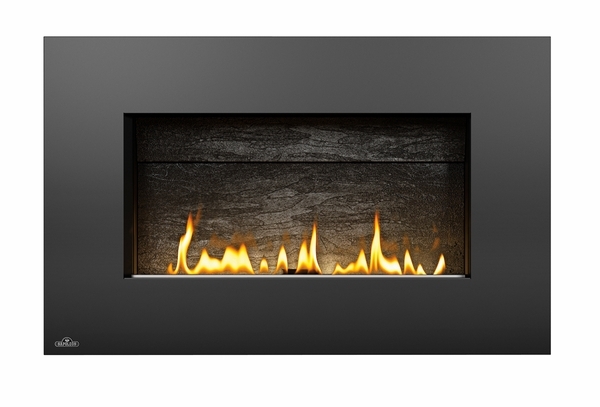 There are all sorts of reasons homeowners choose the Napoleon WHVF31 Plasmafire Wall-Mounted Vent-Free Gas Fireplace for their homes, and all of them are good. Here are some of the more popular reasons they cite for making this such a popular appliance. The convenient vent-free design makes placement unbelievably easy, and the unit is as simple to install on almost any wall as hanging a picture. Once in place, the efficient burner, modern topaz CRYSTALINE ember bed, and exclusive slate brick panel provide a look that is second-to-none. You can also count on the heat-resistant ceramic glass, the fuel-saving electronic ignition, and the limited lifetime warranty to provide long-term peace of mind. This unit also features an attractive surround for added style and a built-in oxygen depletion sensor for safety. It's perfect for almost any wall in almost any home, making the Plasmafire a stylish and sensible home heating option. Is this unit approved for installation in Ontario? This fireplace cannot be installed in Canada where ventless gas hearth systems are not allowed. Additionally, Napoleon fireplaces cannot be shipped to Canada from the U.S. and must be purchased through a local dealer. This unit does not come with a blower and no blower is offered. Can this unit be installed outdoors out of direct weather, on a covered patio? This fireplace is not tested and listed for the application you describe. How long can you run the unit for to heat a room? Can it be used as a primary heating source? Like all ventless hearth systems, you should not use this as a primary heat source and it should only be left on for 2-3 hours at the most. Can this item be mounted into the recessed area on my wall? This unit can not be recessed into the wall. How much of the rectangle unit sticks outside the wall? This wall mounted unit will project 7 3/8 inches from the surface when using the standard rectangular front. Does this have a glass front? Per the manufacturer, the front opening is sealed with a pane of ceramic glass. Air and heat exchange occurs through registers at the sides and top of the unit. Can you use a remote control with this fireplace? Yes, the optional remote controls for this fireplace can be found in the "Accessories" tab on this item page. Does this fireplace work at 8600 ft? While this unit does have better operation characteristics than most at high altitude, it will only operate reliably up to 6,000 feet. Beyond there, the ODS sensor will indeed begin to act up. What is the turn down ratio of this product? Per the manufacturer, this item features a 50% turn down. What is the "Crystalline Ember Bed"? This refers to the glass that comes included with this fireplace. Is it safe to hang a flat screen television over this fireplace? Per the manufacturer, it is not recommended to put any electronic device over this unit. Since it is a vent-free fireplace, most of the heat comes out straight up from the opening. Most television manufacturers will void the warranty if it is installed above a heat source as well. What surround comes with this? No surround is included with this unit. How much area would this heat? With a BTU rating of 20,000, this appliance can comfortably heat approximately 570 square feet. Is electricity required to run the fireplace? Or just a gas hook-up? This unit does indeed require the use of a 110V electrical outlet, in conjunction with the provided transformer for operation. The unit is provided with a battery backup that will allow the unit to operate in the event of a power outage, but the backup is not meant to be utilized on it's own, as the batteries drain quickly and would need to be replaced often. Fireplace arrived quickly and looks very nice. Thanks. We love this fireplace and couldn't be happier with how easy it was to order this and on how they kept in contact with us throughout the process. eFireplaceStore was great to work with! This item was easy to install and works great! I am happy with this heater. Unlike many heaters, it is safe for my children to be around.